Home » Fundrive 2018 is Here! Our first Fundrive starts this Friday, Oct. 5! From then until Oct. 12, we're taking pledges and airing special Fundrive episodes of your favourite CJSF programs, beginning with The Øbservatory on Oct. 5 and wrapping up with Straight No Chaser on Oct. 12. 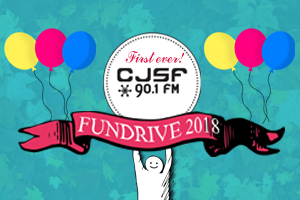 Come celebrate campus-community radio with us during CJSF Fundrive 2018, and help us reach our Fundrive goal of $10,000: call 778-782-CJSF (2573) or donate online at cjsf.ca/donate between Oct. 5 and 12. CJSF accepts cash, cheque and credit card (Visa and Mastercard) payments for pledges. Stay tuned for more Fundrive updates, including updates on personalized incentives from our hosts: follow us @cjsf on Twitter and @cjsfradio on Facebook and Instagram.